If you find your biceps bursting through the arm of your shirt at the end of a day’s video shoot you might be glad of something to make your gimbal feel a little less heavy. A project about to be launched on Kickstarter claims to have the answer – GimbalGun. GimbalGun is a support system that aims to take the weight of a gimbal and associated accessories off the operator’s arm and onto his or her shoulder and upper back. 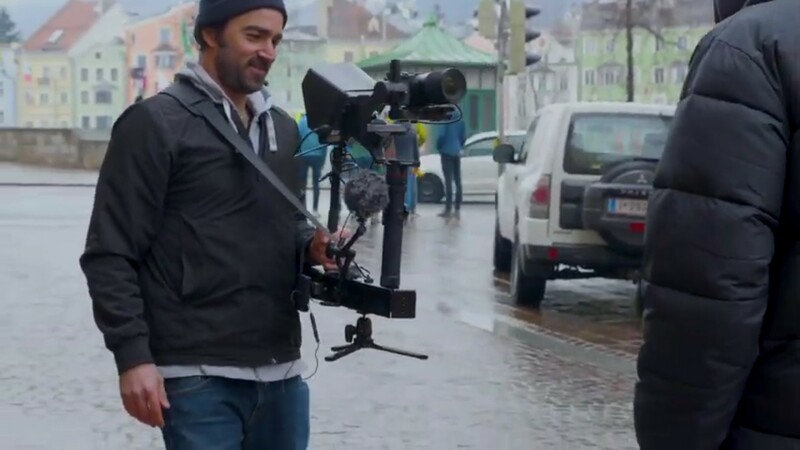 The device consists of a long metal box to which a single-handed gimbal can be mounted and a shoulder strap that helps redistribute the weight of the gimbal and camera. GimbalGun has a number of 1/4in thread holes that allow monitors, microphones, tripods and a host of other accessories to be attached as well, so the whole set-up can be supported on the same system. 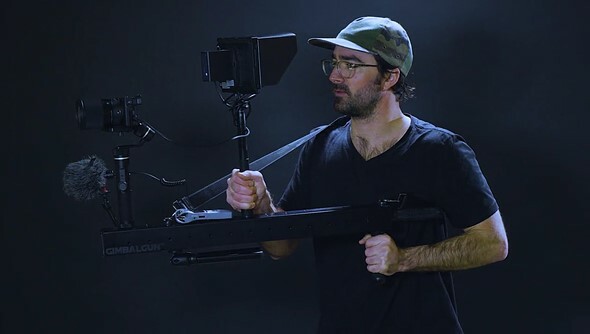 The manufacturer claims that GimbalGun lets videographers shoot longer without getting tired, and that it also provides the means to mount monitors and microphones in more effective positions than when they are simply attached to the gimbal handle. Users can choose whether to suspend the GimbleGun from a shoulder using the strap, or to mount it on the shoulder like a bazooka. The device is made from lightweight aluminium alloy and is hollow, but it is also quite big and must add a significant weight itself to any videographer’s kit. Sample footage is available for inspection on the GimbleGun website…that was shot while the videographer drank a coffee with his spare hand. The Kickstarter page is in draft mode and the campaign hasn’t started yet, but you can see more information there. It looks as though GimbalGun will cost $200, but discounts will be available for early-bird supporters. 1st Aprilnis still some time to come. Why are dp review giving this free advertising? It’s not actually a thing yet.... and in the end it’s just gonna be another knocked up piece of tat which the gullible will shell out for and then bin after trying to use.... if it shows up at all. Here’s an idea... if your gimbal is too heavy, stick it on a monopod. It not only looks front heavy ... it is front heavy. Imagine 2 kg of camera at the end of that stick. "Put your weapon down, now!" "But officer, it's a ..."
As funny as this quip seems, its actual enactment is well within the realm of tragic possibilities. This looks so awkward. I didn’t watch the video and skimmed through the article. Physics man !!! This thing defies the laws of physics in every way. This Monday I meet with a fabricator. I’ve worked at matching shops , fabricating facilities and sheet metal shops a bit . Also built bows and was a carpenter for many years. Bicycled , lifted weights, studied martial arts , ect , ect. Everything is about biomechanics. I have the SteadyCam vest and arm. I’m having my buddy fabricate a bracket to mount my new Moza Air 2 with follow focus to mount onto the SteadyCam arm n vest system. This will create a fourth axis. Also support the weight and give fluidity to the system. I shoot live music videos. I’m the guy on stage , behind, to the sides and in front. I attempt to grab the cool action shots . With the system made floating and with a manual focus I’ll be able to focus through the smoke and lights smashing through the lens. If this works the way I want I’ll attempt to market the bracket. Simple solution to avoid confusion with a gun: paint it pink. Yup, and within a week every gang-banger would have a pink pistol or rifle. There are already instances where real guns have red paint on the muzzle. If we didn't have politicians to come up with stupid solutions, we'd have to improvise. That fellow holding the GimbalGun should sue TechReview for using photos of him without permission. That guy is everyplace. You can’t point your camera anywhere without him being in the picture. Where’s they Kickstarter for summer wool hats, BTW? Tired of coming your hair - just put on a hat. If I had any hair, I would comb it. My wool cap serves a real purpose in the winter, and is never worn in the summer as a fashion statement. Probably the best way to get shot on sight by a police officer is to wear a ski mask while holding a GimbalGun. A really bad decision for anyone in Antifa. gimbalgun, not gimblegun. you're welcome. wow... every time a kickstarter project is featured on dpreview, it appears to be even dumber than the last one. I wonder how anyone can top this one though. if things get bigger and bigger, its soon time to say sod the gimbal, my cameras got 5 axis stabilization and i can use warp stab in post, ill just hand hold the camera instead. I actually dont think i need the crane 2 .. Image stabilization takes care of camera shake, and other quick but low amplitude disturbances. A gimbal smooths out large, relatively slow and occasionally intentional motions. Still photography is one thing, and video is another. The addition of the time element carries a lot of other issues too. Haven't tried it yet, but going to have to try those flag pole marching straps you can get for $20. Rob, if it can launch grenades, then it is well worth the price. That bazooka looking thing in picture three? You can almost feel his pain when he carries 3 kg of camera plus that bazooka more than a meter away. You will need a huge counterweight behind his neck. And ,,, it is not there. But, problem solved as he probably are not going to allowed to use that rig anyhow. To dangerous, and then I do not refer to the neck pain. Please .... tell me this is a joke! This is a joke ... I hope. This article made me check my calander to make sure it wasn’t April 1. Jerry rig a shopping cart if weight is an issue. Yeah, spread the load baby. My eyes rolled so far back I saw the inside of my head. Um, this is a joke, right? I just had to look it up on the calendar if it's already April 1st. Looks like someone whats to get shot by police at very first encounter. If I were to choose a camera to attach to this monstrous contraption I would choose the real big-boys video camera. This is like attaching an external lens to my smartphone. What does this offer that something built out of semi-standardized 15mm rail rigging doesn't? Need adrenaline rush? Get this product and try not to get shot on spot. Just $200 and its yours. When I mounted a camera on my Steyr AUG it worked really really well. Unfortunately it didn't go over so well when I tried to use it in public. 3 words. “DJI Osmo Pocket”. Not the best idea for a gadget to look like a RPG launcher, is it? When Rambo calls for a video shoot! 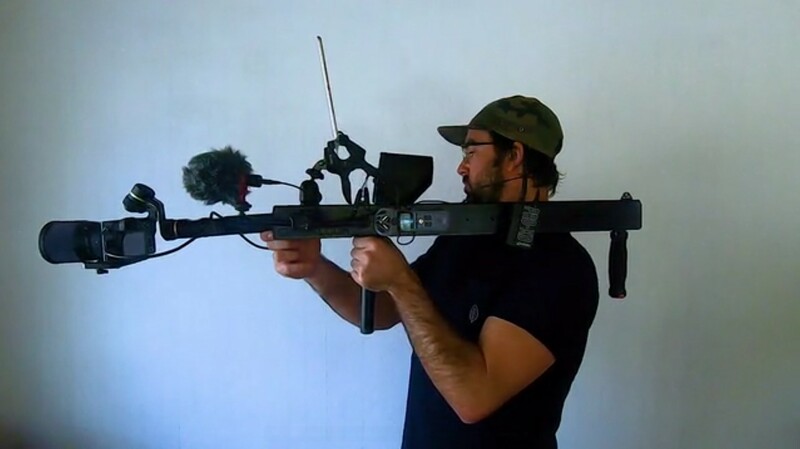 This looks like a poor man's steadicam rig. A gimbal that resembles a rocket launcher? What could go wrong? If I saw someone carrying that bazooka-looking thing down my street I would shoot him dead on the spot—and I don't even own a gun. I'd have to go borrow one from a neighbor, and then learn how to shoot it. But I'd do it because that thing is terrifying. Nevertheless, from an engineering point of view I'm sure it's an elegant and effective solution. How about getting a front baby carrier, and mount the camera where baby head cushion is at. Warning: Do not use in America. Depends where in America... in some places they'll hold a parade in your honor... in other places there will be 9-1-1 calls. DIdn't a reporter get shot by a cop because the cop thought the tripod he was holding looked like a gun a couple of months back? DIY, thanks for the concept. no ones going to buy it rather than just make one at home. What a stupid piece of crap! Was thinking the same thing. This is likely to get you killed in countries like Ah'murica. When the cop with the donut in one hand and .50 magnum in other hand sees you he will unload on you and he will be on the job the next day again. I believe in the United States most peace officers carry something in the .40 caliber/9mm range. @paleodawg - there's a good change the cop will miss. how could the cop unload if he doesn't have his hands free? Nice. My gimbal becomes a labour to hold after a few minutes. But this has me thinking whether I can just simply strap my existing gimbal for free instead. long live DIY!!! i'm still trying to find the actual gimbal in the images.